Denver continued to surge, senior nights made fans and gymnasts cry, more perfect 10s—it was another exciting week in NCAA gym, and we’re here to bring you the highlights. We wanted to show more love to the non-top teams in college gym in 2019, so we broke out our Dismounts into DI, DII (all USAG nationals-eligible teams) and DIII. Each week, we’re also dishing out a few superlatives for some of our favorite moments, looks and results from the weekend of competition. Below those, you’ll find your typical results and highlights from every DI women’s meet. After being out for a few weeks due to a lower leg injury, Hurst returned to the lineup with a bang, hitting her routine for a career high 9.925 on the road. As just a freshman, Hurst is poised for big things in her career as a Tiger. Is there anything better than a senior nailing her final routine at home on senior night? Not much. Kelley has been the heart and soul of this LSU team for the past four years, and capped off a stellar career (maybe?) with her first perfect 10, definitively sticking her final pass to the delight of the crowd and her teammates. Speaking of seniors with sticks, Rizkalla has been on fire with her unique Ilg vault, sticking it in both of Rugers’ outings this weekend. Things were wild throughout UCLA’s home meet on Sunday, but Flatley’s 9.925 for a tentative beam routine with a large bounce out of the dismount was one of the silliest scores. The freshman did this on her first pass on floor and received a 9.850. That ties her second-best floor score this year. Note: The routines selected for this category are not a reflection on the gymnast performing the routine but rather the judging of the routine itself. We could give you context for this, but we’re not going to. Sometimes, #NCAAGym is about more than the scores. The Denver senior has battled through injuries during her collegiate career and has finally been healthy enough this season to train bars. On Denver’s senior night, she competed for the first time after previously only performing in exhibition. She hit her routine and was greeted with a large group hug after she dismounted. The Big Storyline: On Emma McLean and Olivia Karas’ senior night, the Wolverines secured their second-highest score of the season while Oklahoma put up the second-highest score in the nation so far. Olivia Trautman sat out for the Sooners, who used the meet to test their depth. For the Wolverines, Natalie Wojcik debuted her full-in floor pass, making her one of very few gymnasts competing a set with two E passes, and Abby Heiskell broke into the bars lineup. Implications: Both teams secured their rankings for another week. Records: Career highs abounded for both squads; most notable is Brenna Dowell’s all around mark. The Big Storyline: Oklahoma wasn’t perfect and left room for improvement on landings, but it also played around with lineups a lot in its second meet of the weekend, resting Maggie Nichols on beam and Olivia Trautman on all four. The Cyclones posted their highest home score of the season, setting many personal records along the way. Notably, sophomore Natalia Ros Vaquer competed bars for the first time since week one and set a personal best 9.900. Implications: Despite a season best home score, Iowa State drops to No. 26 since this meet will count toward week 11’s rankings rather than week 10. Records: Oklahoma’s Allie Stern came in clutch after a fall to score a career high 9.850. Grace Woolfolk became the first Cyclone to score two 9.925s on beam as a freshman and senior Sydney Converse set her own personal best of a 9.900 on the event. Sophia Steinmeyer’s 9.900 on vault is a career high, as is Natalia Ros Vaquer’s 9.900 on bars. The Big Storyline: UCLA had its most even meet of 2019 across events to tie the best team score of the country this year, but it still has plenty of clean up work to do before nationals. 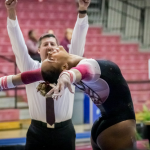 Stanford is showing signs of life after a lackluster first two months, and an excellent floor rotation and the welcome return of Taylor Lawson after an illness led the Cardinal to its road high score this year. Implications: UCLA crept ever-so-slightly closer to Oklahoma while Stanford jumped another spot to No. 23. Controversies: This meet was the crackiest of the Bruins’ season so far. UCLA picked up several extra tenths on both vault and beam, and Stanford picked up a few gifts of its own on beam and floor. The Big Storyline: It was senior night in the swamp, as Gator fans bid farewell to Alicia Boren and Amanda Cheney. While scores weren’t strict, we didn’t see the senior-night-at-Florida level of Carol we may have expected. Penn State managed to take advantage of the night and score its first road-196 of the year. We saw Megan Skaggs return to the all around and hit a complete meet. Implications: The Nittany Lions will jump to No. 24 while Florida will hold steady at No. 3. Records: Florida hit a multitude of career highs, by Sierra Alexander, Megan Skaggs, Alicia Boren, Trinity Thomas and Leah Clapper. Lauren Bridgens, Kourtney Chinnery and Kristen Politz put up personal bests for Penn State. Controversies: Given the other floor 10.0s we’ve seen this season, it seems questionable that Boren didn’t get one for her anchor set. The Big Storyline: It was senior night for LSU, and the Tigers sent their seniors off on a high note with a new season high and their first score above 198 of the year. Despite a few uncharacteristic mistakes, Oregon State was able to record a solid total for its NQS. Implications: There are no ranking changes for either team. Records: The 10s on floor from McKenna Kelley and Kennedi Edney were the first perfect scores for both. Sarah Finnegan’s 39.800 in the all around was a career high and tied for the fifth best score in school history. Kaitlyn Yanish scored a personal best 9.925 on vault. Controversies: Despite the fact that it was senior night and her routines had no major errors, Sarah Finnegan did not receive a 10 for any of her routines, scoring a near perfect 9.975 on bars and beam and a 9.950 on floor. All three scores were loudly booed by the crowd in the PMAC. 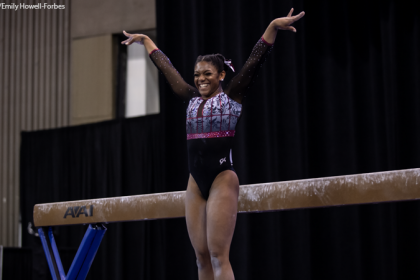 The Big Storyline: Arkansas finally got its life together, hitting a clean bars rotation for only the second time all year to pull off a decisive season high. The Razorbacks had a frustrating start to the season, and it’s great to see things finally looking up. Minnesota squeaked over 197 for the second time this year while a stellar Georgia floor rotation allowed it to cruise to the win. Implications: Minnesota will jump up by one spot, tying Kentucky for No. 9. Records: Minnesota’s Paige Williams tied the school record on floor. Controversies: Scoring was loose throughout, especially on floor where over a third of the field scored 9.900-plus. In comparison to the rest of the field, Minnesota’s bars and beam felt fairly conservative. The Big Storyline: Alabama beat Auburn for the second week in a row, with both teams scoring higher than last week in a display of upward momentum. However, neither team ended the day without major errors (particularly on beam for Alabama and vault for Auburn) they’ll need to avoid for the conference championship. Implications: Alabama narrowly avoided the prospect of an SEC afternoon session with this win, but Kentucky can overtake it with a modest score this weekend. Records: Auburn earned its second highest beam total in program history with a 49.550. The Big Storyline: BYU hit 197 for the first time since 2004 after an inquiry raised its score from 196.975. The Cougars put together a clean meet and were able to capitalize on mistakes from the Broncos. This was a good-not-great meet for Boise State in which it had to count a fall-like number after a fall, as well as a gymnast taking an extra swing. Implications: Boise State’s national ranking dropped to No. 13 while BYU jumps to No. 14 overall. Despite BYU’s impressive performance, Boise State remains atop the MRGC and BYU remains in second in the conference, but the gap is rapidly closing. Records: Shannon Evans’ 39.575 all around score is a career high. Tatum Bruden’s 9.875 on vault is a career high. The Big Storyline: Kentucky recorded its best score in program history on senior night, a fitting way to send off its most accomplished class ever. Junior Mollie Korth swept all four events as well as the all around. Central Michigan had a solid day and earned a road score it desperately needed to stay in regionals contention. Implications: Kentucky moves up to No. 9 nationally, tied with Minnesota. Central Michigan moves back into regionals territory at No. 32. Records: In addition to Kentucky’s best score in program history, several Wildcats set career highs at this meet, including Mollie Korth on beam (9.925) and in the all around (39.675), Alex Hyland on floor (9.925), and Katie Stuart in the all around (39.450). Central Michigan’s Skyler Memmel also set a career high on beam with a 9.900. The Big Storyline: The Bears struggled on bars, with falls from both the fifth and sixth gymnasts, but upped their game on vault: Talitha Jones and Rachael Mastrangelo both competed Yurchenko one and a halfs to join teammate Milan Clausi. Jones set career highs on all three of her events. San Jose State is still struggling with depth, but it had a solid meet on senior night and will use the score for NQS. Implications: California will drop a few spots in rankings and doesn’t have much longer to prove it’s capable of 197s if it wants to keep its nationals chances alive. San Jose State is effectively out of regionals, but it continues to be ranked very closely to conference-mate Air Force—the fight between this pair at the conference championship will be fascinating. The Big Storyline: Lindenwood! This SEC upset is a season-high mark for the Lions and comes just after UIC put up the first 196 of the USAG season on Saturday. Look for the battle between those teams at MICs and USAGs to be fierce. Missouri didn’t have any disasters, it just had an off day. The Tigers did go five-up on vault, but all were hits. This ties a season best for SEMO, a team yet to hit 190 in 2019. Implications: Missouri will fall to No. 19, and Lindenwood will creep up to No. 39. With two away meets to go, regional qualification is still possible for the Lions if they can repeat this sort of score at each. The Big Storyline: Denver extended its streak to six straight scores above 197 and swept the field in its home finale. Senior Grace Broadhurst made her collegiate bars debut on senior day and the Pioneers were without Mia Sundstrom as they rest her to recover from a rough fall two weeks ago. Nebraska started slow but was persistent and finished strong on its last two events to break 196. Implications: Denver moves up to No. 5 overall, passing Utah after the Utes were on bye this weekend. Arizona State and Nebraska hold their rankings this week while Pitt drops a spot to No. 43. Records: Denver’s No. 5 national ranking is the highest in program history. Justine Callis recorded a career high 9.825 on bars. Controversies: Not exactly a controversy, but the Pioneers honored the visiting teams’ seniors before the meet on senior day in Denver, which was a nice touch for those gymnasts. Many also thought that Maddie Karr’s vault and Lynnzee Brown’s floor could have gone 10, but each earned a 9.975. The Big Storyline: For Sacramento State, this meet was a game changer. The Hornets beat their season high by over two points with the help of a season-best bars rotation. 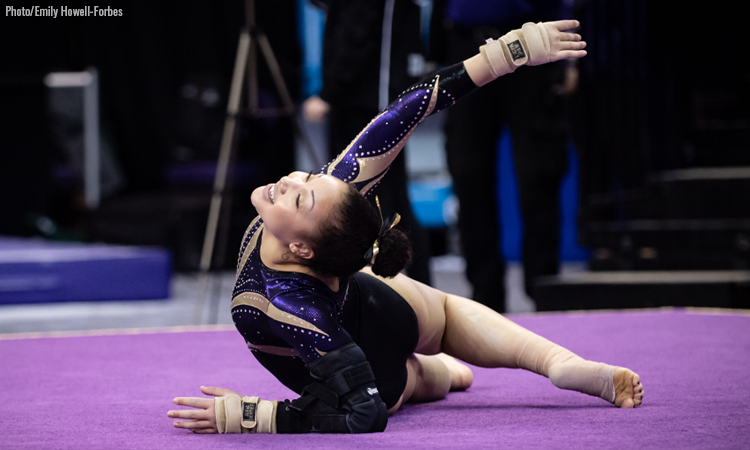 Washington came close to a season high after a great floor rotation that featured an E pass from senior Kristyn Hoffa that injuries have prevented her from competing for most of her college career while Iowa was forced to count a fall on bars. Implications: Iowa will drop two spots and remains on the edge of regionals qualification. Sacramento State jumps three to No. 61 while Washington creeps up to No. 17 and the edge of regionals seeding. Controversies: The stream for this meet was a mess: long stretches had no audio, it went down altogether several times in the middle and when it did work, it didn’t follow the narrative of the meet effectively despite the best efforts of Washington’s excellent in-house commentator Alisa Mowe. The Big Storyline: It was senior night in Columbus, and the Buckeyes proved they really are back on track after a slow February. 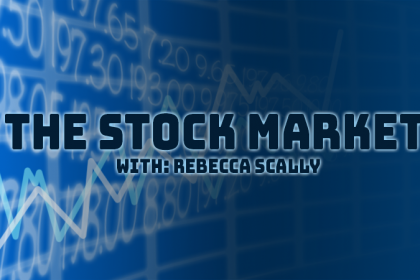 They will happily add this score to their NQS, putting to bed an unseemly 194.900. This is Bowling Green’s highest total of the season, so it won’t be counted in NQS but will allow the Falcons to drop a 189.500 season-low from last week. This was the Buckeyes’ last-ever performance in St. John Arena, as the new Ohio State venue will open for the 2020 season. Implications: Neither team will see significant movement. Controversies: The drama around the Bowling Green coaching staff seems to have largely abated for now. The Big Storyline: N.C. State scored its second 196 of the season to top the field on senior day. George Washington and Arizona also had fairly solid days, but some uncharacteristic mistakes on beam and bars, respectively, took the total scores down. Implications: N.C. State remains steady at No. 27 and looks to be in a good position to qualify for regionals. George Washington falls to No. 36 and will need to better its performance from this weekend to keep from falling out of regionals contention. Arizona drops to No. 31, as this score here will not help its NQS. Records: Drew Grantham set personal bests in the all around (39.475) and on beam (9.900). Cydney Crasa earned a career high 9.850 on vault, as did Maddi Leydin with a 9.900. The Big Storyline: Southern Utah finally got its floor life together and put together a complete meet for its second highest score of the season. Utah State put up a comparable number to what it’s produced all season. The Aggies’ meet was highlighted by senior Madison Ward-Sessions’ 9.975 on floor in her final home performance. Implications: Southern Utah is now at No. 25 overall while Utah State drops to No. 41. MRGC rankings are unchanged. Records: Thunderbird Karley McClain set several career highs, including a 39.450 in the all around and a 9.900 on beam. Stephanie Tervort’s 9.875 on bars is also a personal best. Ward-Sessions’ 9.975 on floor is a career high and ties the school record for highest floor score, previously set in 1999. Her 20 career event titles on floor is also a program record. The Big Storyline: This meet ended up being very close. In spite of the tight scoring (see below), these teams put out solid team totals. Southern Utah’s was especially impressive considering it was its second 196-plus of the weekend. Implications: Southern Utah has entered the top 25, coming in at No. 25 in the rankings after this week. Records: Maya Washington’s 9.925 on floor was a career high. Controversies: Some fans thought scoring was incredibly strict at this meet, and even head coaches Elise Ray and Scotty Bauman were both visibly infuriated. Madison Loomis’ floor score was also reviewed and eventually changed after a SV inquiry. The Big Storyline: New Hampshire recorded a new season high score and its third 196-plus score of the season to finish ahead of Yale, who also had a great day. The Bulldogs posted the second highest total of the season, as well as the fourth highest total in school history. Implications: New Hampshire holds steady at No. 30 nationally. It still has a 194.950 and 195.375 counting in its NQS, so if the Wildcats post big numbers in their last two meets, look for that ranking to go up. Records: Danielle Mulligan’s 9.950 on bars ties her career high as well as the school record. The Big Storyline: This meet looked like it would be all North Carolina after it opened with a 49.425 on floor. Vault was also strong, and then the team completely fell apart on bars and beam. This is Rutgers’ highest road score of the year and will knock a low-194 out of its NQS. It is also a high road score for Ball State. Implications: Kent State will drop a few places but remain in the regionals picture at No. 35. Controversies: Note: as of writing, Road to Nationals is missing beam scores for Rutgers and has the score incorrectly factored into its NQS ranking. It’s NQS should be 194.633, and it will remain around No. 45. The Big Storyline: UIC took the State of Illinois crown, snatching it from the Illini, who have won the past 11 years. All four teams put up season best totals in what was a thrilling meet start to finish. UIC is now undefeated since January 4. Implications: UIC and Illinois will each drop one spot, to No. 34 and No. 37, respectively. Illinois is in serious danger of missing regionals. Northern Illinois will jump to No. 41, and Illinois State will fall to No. 56. Records: This was UIC’s highest score since 2004. Illinois’ 49.400 beam total ties for the second highest in program history. Northern Illinois’ total is its fourth-best in program history. The Big Storyline: Maryland scored a season best 195.975 and earned at least a share of all the event titles to sweep the meet. Temple also had a fantastic day, earning the second highest score of the season and tying the floor record. Implications: Maryland moves up to No. 29 nationally while Temple moves up to No. 48. Records: Temple’s score of 49.300 on floor tied the program record set last season. Erica Fuchs earned a career best 9.850 on floor. Sabriyya Rouse’s 9.875 on floor was also a career high. The Big Storyline: The top three teams in this quad put up at top-tier meet for season bests and in Pennsylvania and Southern Connecticut’s case, a new program record. Brown’s day was about average for the team this year. That’s two meets and two season highs back to back for Maryland this weekend. Implications: With this total, Maryland’s previous high, a 195.975 from Friday, will get added to its NQS, and it will move into the top 30 at No. 29; if it can inch up a bit more, it may escape regional play-ins and go directly to a Friday regional session. Records: This is a program record for Penn and Southern Connecticut. 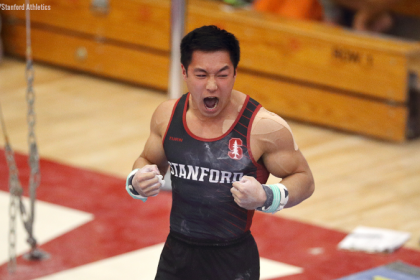 The Big Storyline: The MPSF trio all picked up very useful NQS scores on Friday. A great day from UC Davis’ all arounders, Gabby Landess and Kelley Hebert, led the Aggies to their fourth-straight 195. Air Force’s Salamone picked up event titles on both of her two events while Seattle Pacific scored season highs on bars and beam on the way to its highest road score of 2019. Implications: Everyone’s rankings will stay the same heading into the last week of regular season. UC Davis is going to be right on the edge of regionals qualifications. Records: UC Davis registered its third highest beam score in program history, a 49.200. The Big Storyline: It was senior night for Rutgers, and the Scarlet Knights sent their seniors off on a high note with a first place finish and a season high on vault. Towson had a rough beam rotation, with none of its first five scores above 9.575, but freshman beam phenom Emerson Hurst scored a huge 9.925 to change the tide heading into floor. Implications: Towson drops three spots to No. 58. Records: Shannon Farrell’s 9.925 on bars was a career high. The Big Storyline: This meet was just fine, but not stellar, for both teams. MAC competition is hot this year, and it will take a high-195 to a 196 at the conference championship to take the title. Both of these teams are capable but will need to improve the 9.6-level sets at the beginning of lineups in the next few weeks. Implications: Western Michigan will move just ahead of Eastern Michigan nationally and in the MAC. Controversies: There was neither live scoring nor live video for this meet. Hi, 2019. The Big Storyline: Temple scored its first 195 of the season to top the field on senior day. Probably the biggest story of the meet, though, was that DIII Centenary nearly upset DI William & Mary, ultimately finishing just 0.025 behind. Implications: Temple moves up a spot to No. 48 while conference-mate William & Mary holds steady at No. 62. Records: Temple’s total was the third highest score in program history. Monica Servidio earned a career high 9.825 on vault while teammate Delaney Garin earned a career high 9.850 on beam. Taylor White’s 9.725 on vault was also a career high.